May 25, 2013 0 comments on "How to Grow Salad in a Container"
I saw the idea for this fun garden project at one of our local nurseries. 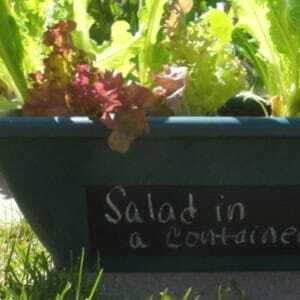 It is a container garden, for growing salad and lettuce! The idea behind this container garden is that you can clip off the top of the green lettuce leaves, leaving an inch or two of the lettuce remaining in the container. In a week or so it will grow back and you can cut it again to make more salad! All you need is a container or pot that you can set out on your porch or patio, some potting soil, and some lettuce plants or seeds. Amazon sells a great bundle that contains 8 different packets of lettuce seeds. Just keep in mind that if you grow the lettuce from seeds it will be at least a month before you have lettuce you can eat. In the spring you can buy lettuce plants at your local garden nursery. I spent about $4 on the lettuce plants for my container. Plant your seeds or lettuce plants in potting soil and water it well. Place the container in a sunny location for best results. You may need to water daily during very warm weather. If you want to decorate your container with chalkboard paint like I did, then you also need to buy a can of spray chalkboard paint. Use masking tape to tape off the area where you want to have the paint. Keep in mind that there is a lot of overspray, so make sure any area you don’t want painted is covered up well. This stuff is also really toxic, so try to do it outside if you can or at least make sure all the windows are open before you spray it. The chalkboard paint takes about an hour to dry completely. Make sure your surface is clean and dry before you apply the paint. After it is dry, use chalk like this dustless chalk to write on the container. You can do this on any kind of planter in the place of using plant markers.